Thanks to all who attended our October Firepit Class. Over the years, we've inspired many customers to tackle firepit building, including the feature photo above by Leighton LaPierre. Below you'll find descriptions of our varied firepit styles. An easy kit with perfect way to achieve function and looks. Available in round and square kits with removable grates. You can set the height by adding extra layers. Also great for other wall building projects. The Anchor Highland kit offers another freestanding wall system that can be customized to any height. It's chiselled edges provide a rustic look, as do the capstones included. A masonry fireplace kit by FireRock, complete with fire mortar. Stack and then dress up with your choice of stone. See Featured Photo at top for example. Our Caveman firepit can be built using thick dry-stack stone or with one-man fieldstone boulders. If you want to test your masonry skills, we sell firebrick and firemortar. Build the structure and then face with stone veneer and irregular capstones. This kit comes with a pre-buiilt duroc shell to decorate with stone veneer and your choice of capstones. You don't have to sacrifice aesthetics any more with our beautiful new rainbarrels. Many colors and designs to choose from, or let us custom make one for you. Wooden stands available to easily get your watering can under the spout. WHO SAID FIELDTRIPS HAD TO BE BORING? Some lucky Cape Fear Academy 4th graders attended a hands-on learning experience with Cape Fear Community College geologist, Phil Garwood (popularly known as "Dr. Rocks"). All the students sent lovely thank-you notes and gave Dr. Garwood and our stoneyard high marks. Check out Buck Wild BBQ & Saloon, newly opened near College and Market in Wilmington. 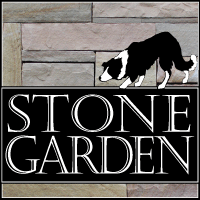 While there, be sure to notice the stonework throughout - a natural, thin-veneer called Sierra Shadowstone. This cast limestone Valencia Fountain is on sale now in white. Was $520. Our treasured supplier of Florian glass bead jewelry is closing her doors. Large order, just in. Come get them while they last. Earrings just $24. Stylish seaglass earrings in all shapes and colors. Perfect gifts. Only $18-24. Rough and polished malachite make perfect paperweights. Starting at just $7.00. Print your Coupons by right clicking and copy into a Word file. LIMIT ONE COUPON PER CUSTOMER. EXPIRES 11/30/13. LIMIT ONE SALE PER CUSTOMER. EXPIRES 11/30/13.